António Guterres, the new Secretary General. Khalid Mohammed AP/Press Association Images. All rights reserved. António Guterres, former Prime Minister of Portugal, former High Commissioner of the UN’s agency for supporting refugees, will be the next UN Secretary-General. The decision was, in an unusual show of unity, announced at a press stakeout by the Security Council’s 14 male ambassadors and one woman ambassador on October 5th immediately after the sixth round of voting. These polls have been informal, but October 5th was the first occasion on which vetoes were revealed (without indicating their source) through the use of red ballots by the Permanent 5 members. Guterres was the only candidate on the list of 10 to exceed the 9 positive votes required, and the only one to receive no vetoes (though there was one abstention). Guterres’s success should come as no surprise – he has topped all six of these internal polls, held since July this year. But logical procedure is far from the norm in this secretive process, and he had not until a few days ago been expected to avoid a Russian veto. Russia, in its current Cold War throw-back belligerence in international affairs, had been insisting that the winner should for once and for the first time be an Eastern European. The eleventh hour entry (five days before the vote) of Bulgarian Kristalina Georgieva to the race was thought significantly to challenge Guterres, because she fit the bill as an Eastern European and had an impressive record of managerial efficiency as the European Union’s budget chief and prior to that, as European Commissioner on humanitarian issues. She is also a woman. The demand that this Secretary-General be a woman and a feminist has been expressed with growing insistence by women’s rights groups around the world and by dedicated campaigns and petitions. Two central arguments drive this demand. The first is substantive: the UN has failed to use its resources and power to promote gender equality effectively. Women’s rights have been a latecomer and continue to be an afterthought in the UN’s development, peace, and human rights work. In development, growth and poverty reduction strategies fail to address the foundational role women’s unpaid work plays in economies, and fail to finance women’s well-being and livelihoods. In peace, women are still mostly excluded from peace talks and are marginal to post-conflict political settlements; they are noticed mainly when they are victims of violence. In human rights, while normative frameworks establish women’s equal humanity with men, many perpetrators of crimes against women enjoy impunity the world over. And across all of these areas, it has been difficult to establish just how marginal gender equality work is, since the UN’s own systems for tracking its spending on women’s rights and gender equality are not comparable across different agencies. Where we can track spending, results are unimpressive. The UN’s peacebuilding work, for instance, has fallen far short of the modest target of 15% spending on gender equality that it set itself 6 years ago (and yet this sector does better than others). The second argument for a woman SG is about the symbolic impact of the role. The fact that there has never been a woman at the helm of the UN – and indeed that until this year’s selection process there have been less than a handful of women even running as candidates – is a stark illustration of how male-dominated decision-making makes female leadership not just rare, but virtually inconceivable. To have a woman as the world’s top diplomat would have sent a dramatic signal of progress and change. And not just any accomplished and talented woman, but a feminist woman, unafraid to champion gender equality as a core and crucial value and project in international relations. At a time when the UN must urgently rise to the unprecedented political and environmental challenges of the 21st century, it seems antique to be relying on the familiar old (and Western European) cast of characters. While no-one in the campaigns for a woman SG ever pretended that a single woman would have solutions to these problems, a fresh start would have been signaled by selecting a feminist woman to trigger reform. Linked to the symbolic argument were recent revelations about the dramatic deficit in female leadership across the UN. Ban Ki-moon’s frequent assertions of progress in appointing women to high office were refuted by data that showed 84% of his appointments to top posts in 2015 were male. This also revealed that the region often seen as pressing hardest for women’s rights – Western Europe and Anglophone countries – contributed just one women in the 23 top appointments it scored last year. 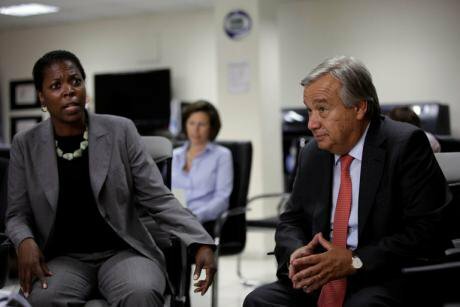 Other research published on openDemocracy revealed that the rate of increase of top appointments of women has stalled over Ban Ki-moon’s tenure, and this parallels a pattern found at the middle management level where the pipeline of women to senior positions has narrowed to a trickle. It is naïve to think that greater numbers of women staff – even gender parity – would necessarily produce feminist outcomes or working methods in historically gender-biased institutions. But it is next to impossible for feminist processes and actions to emerge from historically patriarchal and unrepentantly male-dominated institutions. Fully aware of the ‘She4SG’ campaigns, the male candidates this year proclaimed their feminist credentials, often very convincingly. For the Campaign to Elect a Women SG this was not enough, and on October 5th it issued a terse statement describing the selection, once again, of a man, as ‘a disaster for equal rights and gender equality’. It went on to say that the decision ‘represents the usual backroom deals that still prevail at the UN. There were seven outstanding female candidates and in the end it appears they were never seriously considered’. Indeed, failure by the Security Council to demonstrate serious consideration of the women candidates can be seen in the fact that they were routinely relegated to the bottom of the list in the straw polls. This cannot be said to reflect geographic origin. Helen Clark, with equivalent credentials to Guterres and, like him, not an Eastern European, was consistently pushed below 5th place. Eastern European women candidates from countries close to Russia, like Natalia Gherman from Moldova, were never seriously considered, whereas some male candidates with, arguably, as faint a trace in terms of global public recognition, such as Miroslav Lajcak (Slovakia) and Vuk Jeremic (Serbia), came second and third in the final tally. When the Security Council faced the press late in the morning of October 5th the decision was presented as based on merit. US ambassador Samantha Power said: So in the end, there was just a candidate whose experience, vision, and versatility across a range of areas proved compelling.’ Disappointingly, neither she, nor Russian ambassador Vitaly Churkin, mentioned the global pressure to select a woman for the job. Power went on to reference current serious security challenges and to say: ‘If we have these transnational threats and we don’t have somebody at the helm of the United Nations that can mobilize coalitions, that can make the tools of this institution – creaky though they are, flawed though they are – work better for people, that’s going to be more pain and more suffering and more dysfunction than we can afford.’ Guterres, by implication, is ‘a safe pair of hands’ at the helm of the UN. It is not news that gender bias interferes with how ‘experience, vision and versatility’ is assessed, but gender bias may have had less to do with the Security Council’s decision than the nature of the agreements reached with the P5 on the distribution of major roles in the UN. Unsurprisingly, speculation is flaring regarding the deals that must have been struck to generate Russian support for Guterres and US acquiescence to that arrangement. It is said that Russia hopes to gain leadership of the Department of Political Affairs, the UN’s core source of political analysis, home of the UN’s envoys and mediators, the leader on post conflict elections and peace talks. In short, it is the political engine of the UN. The US has held its top position for some time, but Jeffrey Feltman, a career US diplomat, is scheduled to step down in March next year. Feminist UN observers have not been fans of DPA because of its failure to exploit its role in shaping the ‘good offices’ work of the UN to seriously promote women’s role in conflict resolution or to promote gender quotas in post conflict elections. But under leadership that could share Russia’s lack of enthusiasm for human rights and gender equality, DPA might surrender the slow progress it has made in these areas. The outcome of the negotiations will emerge over the initial few months of 2017. They, as much as the choice of leader, will determine whether the UN can ‘work better for people’, to repeat what Power said. We know little about these decisions, but one thing is pretty certain: bringing the UN up to speed on gender equality was not a priority. Unless the General Assembly moves to adopt the popular request to limit the SG’s term to 7 years, it might take until 2026 before another opportunity arises to appoint a woman SG. As UN reporter Peter Nadin notes: “next time around the call for a female secretary-general will be deafening.” Feminist activists are bitterly disappointed about the lack of serious discussion given to the issue of gender bias at the UN during this process. A number of organizations have developed a feminist agenda for the new SG’s first 100 days in office, posted on Equality Now’s website. Organizations can sign on via this link. Guterres faces a vast number of challenges – most urgent of which is resolving the Syrian crisis. His selection, given his background as head of UNHCR, includes acknowledgement of the extent to which today’s refugee crisis portends future upheavals that can be expected to flow from conflicts and environmental crises. These upheavals will require dramatic re-thinking of the very basis for multilateralism and the role of national sovereignty in the context of shared crises and massive human rights abuses. Women’s transnational movements have always stressed the need for global, not just national, solutions to such crises – indeed, the 1915 Hague International Congress of Women issued one of the first calls for institutionalized global governance. The world is currently re-nationalizing, as shown by Brexit and the closing of borders to refugees and immigrants. It is shifting towards right wing and personalized ‘strong-man’ decision-making, as indicated by the rejection of the Colombian peace deal and the demagoguery illustrated by Trump’s campaign in the US. These processes are sharply gendered, encouraging belligerent and even violent expressions of masculinity and invoking idealized visions of nation and family based on restrictions on women’s rights. Falling back on familiar old boys’ networks seems desperately inadequate to address this problem. The campaigns to elect a feminist woman SG have at the very least succeeded in making feminist reform at the UN an urgent matter. An early confidence-building measure by Guterres that would signal a fresh step forward would be to adopt the feminist agenda for the first 100 days. The agenda combines desperately needed internal reforms to address profound sexism within the UN, with actions to unblock the UN’s political and operational work on women’s rights. It also requires early and sustained collaboration between the new SG and women’s organizations around the world to set priorities and develop a timeline for the fifth World Conference on Women. It is a massive and a tough job and it is his now.